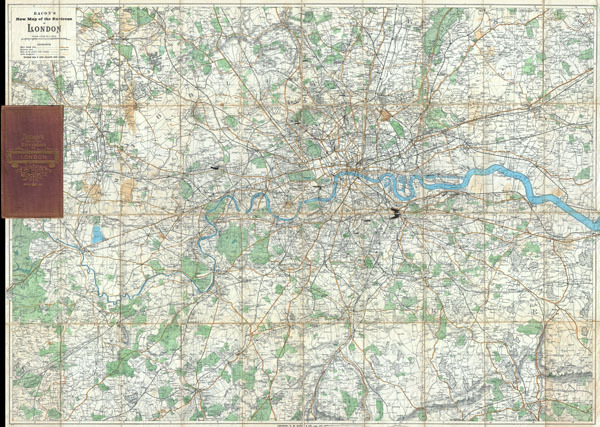 Bacon's NewMap of the Environs of London. A rare c. 1895 folding pocket map of London and its environs by G. W. Bacon. Covers the London area from Rickmansworth in the northwest to Keveldon Hatch in the northeast. Extends south to Whitewater Common and Ightham Common. Offers extraordinary detail, often at the level of individual buildings, throughout noting manors, mills, roads, towns, forests, parks, castles, railways, cemeteries and bridges. Published by G. W. Bacon in pocket format c. 1895. Dissected into 40 sections and mounted on linen. Folds into original red gilt stamped linen binder. Very good. A could of minor ink marks near central London. Wear on original folds. Original linen backing in good condition. Detached from original red linen booklet - which is included.